Even with proper pool maintenance, inevitable damage and corrosion of pool surfaces is bound to take place. Whether it’s from general use, damage from the sun, or improper pool chemistry balance, there is no surface available on the market that is impervious to degradation. There are a variety of resurfacing options available on the market and they all have their pros and cons. Here are a few to consider. Epoxy paint is often used as a viable option for short-term resurfacing. It can do a decent job of covering up damaged or stained sections and provides a seal against forming cracks or leaks. It is the least costly of all resurfacing methods but it is inherently limited in its ability to provide long-term protection against further damage. Although not recommended, it is an intermediate step while you are considering more permanent repair options. Plaster is a classic pool surface material that might even be what you currently have. Using plaster is relatively inexpensive and it provides a clean basic finish that comes in a range of colors. Plaster can also be used as a suitable patching material if you are just wanting to resurface a few particularly damaged or stained area. Aggregate pool surfacing material is made up of a combination of plaster and some kind of quartz or pebble. It is quite a bit more pricey than simple plaster and is designed to lend a textured, sparkling effect to your pool water. While many pool owners enjoy the relatively rough nature of an aggregate surface, it can also be uncomfortable on the feet and therefore might not be the best choice if the pool is most frequented by children or elderly guests. Covering the entire surface of a pool in tile is the most deluxe option for pool resurfacing. It comes in an extremely wide range of colors and textures that can be assembled in an infinite combination of patterns. This option is the most visually striking but it is extremely expensive and labor intensive. 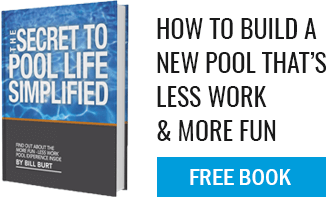 Whatever you do, try not to prolong pool resurfacing when it is needed. Damaged or corroded surfaces can lead to more considerable issues like serious stains or leaks that can ultimately contribute to structural issues with your pool that become very costly to repair.